For nearly a year now, I’ve been geotagging all my photos (marking them with latitude and longitude) with the help of a GPS logger that I hang from my belt. 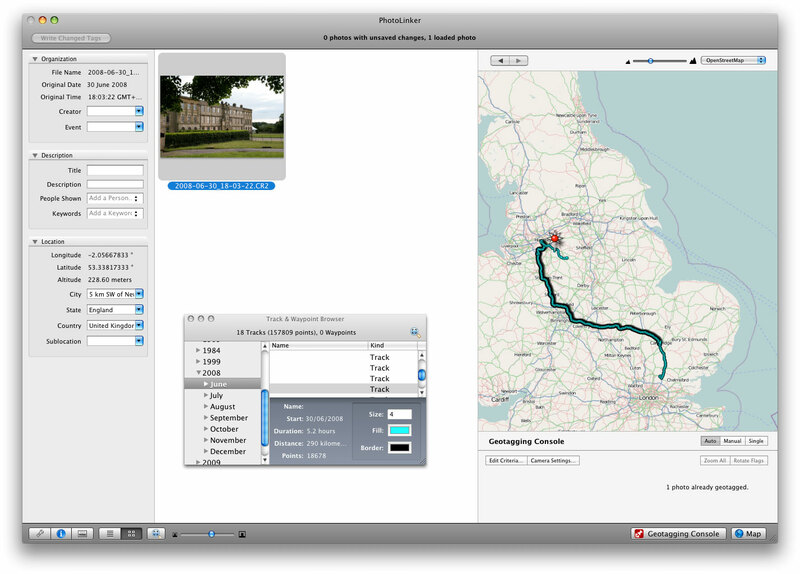 The upshot is that in Aperture, for example, I can right click on any photo, and select ‘Show on map’. Google maps pops up with a pushpin at the location of the photo. My camera and the GPS logger don’t actually talk to each other. The photos and the recorded GPS positions are linked up using their timestamps after I’ve copied them onto my laptop. I’ve been using Jeffrey Early’s GPSPhotoLinker utility to do this, which has worked nicely, but this last week he released a new, renamed, and much-enhanced version: PhotoLinker 2.0. This lets you browse your GPS tracks with a map interface, geotag your photos with a great deal of control, and is definitely the best Mac utility that I’ve tried for this stuff. I’ve been beta-testing it for a little while, but it’s great that it’s now public. Even if you don’t do the photo-geotagging thing, it’s a nice way to view GPS tracks. You can select from a variety of background maps. Have a look at the introductory screencast to get a feel for what’s involved. For those interested, in my case, PhotoLinker is just part of my ‘workflow’. The AMOD device records NMEA logs as plain text files, and appears as a USB flash drive when I plug it in. Chronosync fires up automatically and copies any new logs onto my hard disk, then runs a Makefile which uses GPSBabel to do some filtering and create GPX versions of the tracks. GPX has now pretty much supplanted NMEA as the lingua franca of GPS logs and PhotoLinker can read GPX files directly. I use Aperture to manage my photos, but I’ve told it not to keep them in its library: it manages them in an external directory, which also means that apps like PhotoLinker can access them easily.